If you hate winter, hooray, January is half over. I’d do a happy dance but I’m too old for such frivolity. Diabetic neuropathy is creeping up making jumping more difficult. 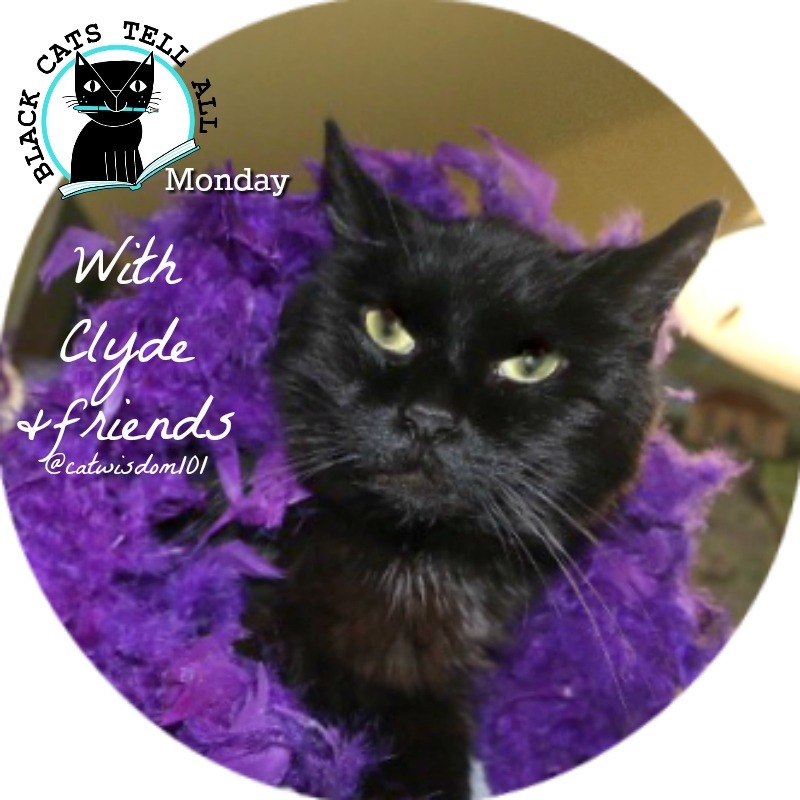 But it’s Black Cats Tell All Monday so I’ll be a good sport. 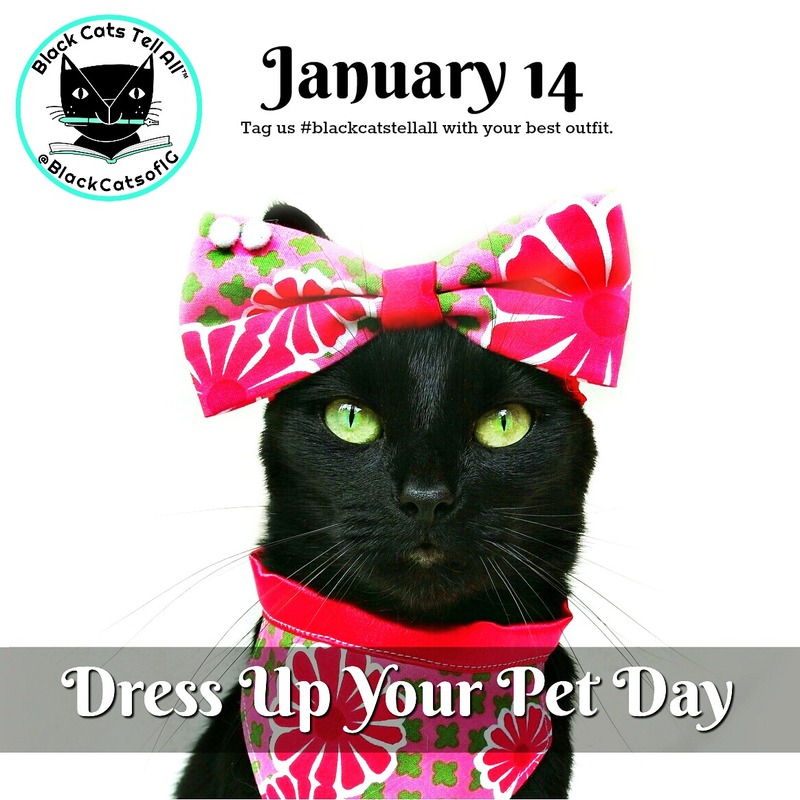 Today is Dress Up Your Pet Day and tomorrow is National Hat Day. I’m doing double duty with this feather boa get up. My assistant will pay dearly for such embarrassment. I asked my fursibs if anyone would like to join me and they snubbed me. 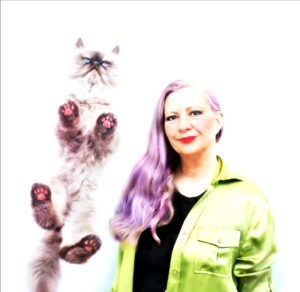 Nou Nou had the nerve to get anti-fur political. She’s about as keen being photographed as I am but Layla caught her snoozing (and this is a first) in MY bed which I share with Layla. It was so shocking Iet her be while I slept in my warm lair by the chimney. We aren’t the best of friends but I do agree with her quote. For those of your not on Instagram, this is our IG story today which winds up on Facebook and Pinterest through social media magic or machinations. I can’t be bothered to keep track and frankly we’re rather nonplussed, disenchanted actually trying to keep up with the numbers and relentless pressure by Facebook et al. to buy advertising. Sorry, but we don’t support platforms we can’t trust with our privacy. So your won’t see too much engagement or us bouncing around. It’s costly not be as visible but none of team is getting any younger and we’d rather have quality interactions than quantity. We’re been scarcer than hen’s teeth on Twitter lately too. We’re depending and hoping you dear reader will continue to share our posts where ever you feel like it. The only busier platform for now is our @blackcatsofIG on Instagram which is still fun. It’s amazing how many of our followers have gone on the surpass us with impressive numbers. Well done, black cat power! Our greatest pleasure is connecting directly with our readers right here and our subscribers’ inboxes. That’s where we share cool stuff not seen here including contests. And we love getting private messages. Keep those sweet letters coming. 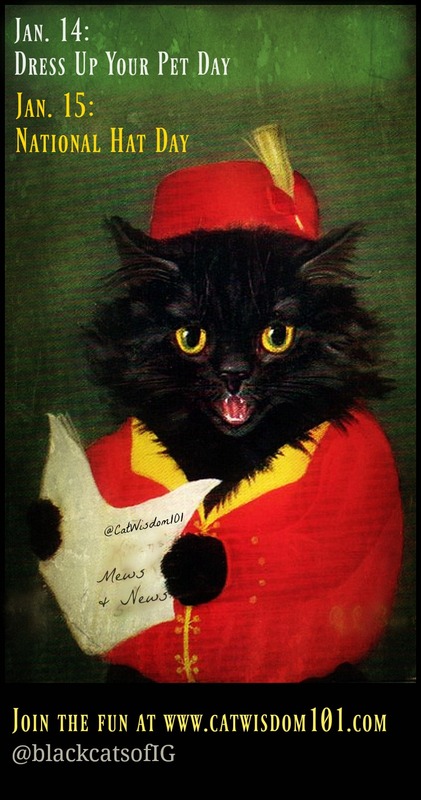 Cats have worn hats and other feline frippery for eons. 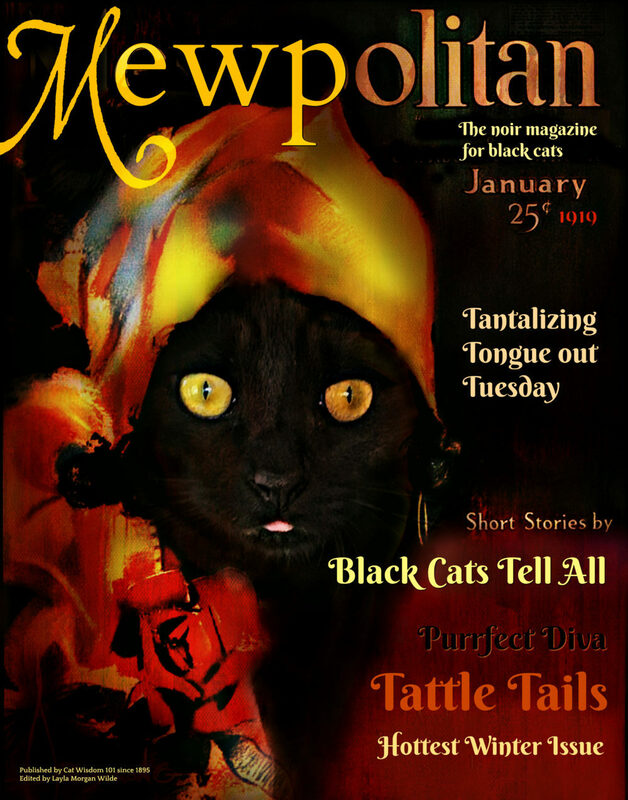 I found an old copy of Mewpolitan from 1919! 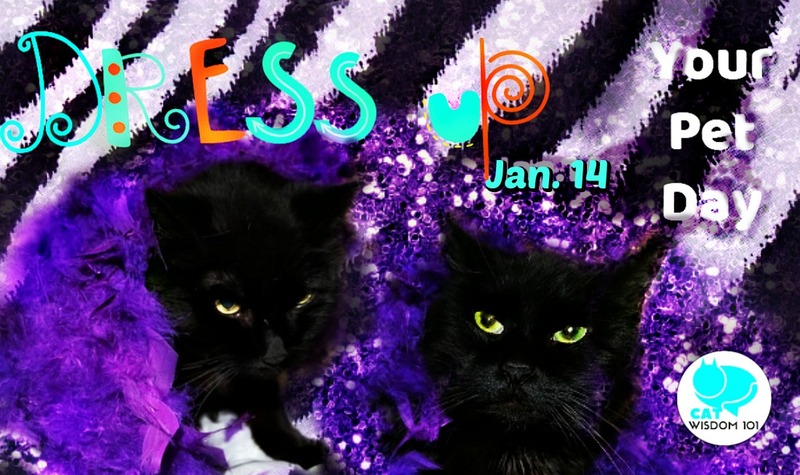 Black cats have graced the covers of many magazines. Sophie is a real model with 240,000 followers on Instagram @sophie_the_model She knows how to pose but she also know how to keep it real and real funny. Now if I were going to wear a hat, I’d look badass as Dart Vader but not as good as my two black brethren, Taort and Papa. Papa is featured in our book and lives with fashion model Geri Gongora in L.A. Gorgeous Taort is a Bombay. So, who wore it it best? And what should I ask for my birthday on the 19th??? Love all of them! Awesome job of dress up cuties. We love both Dart Vaders! They are both superb as the character. 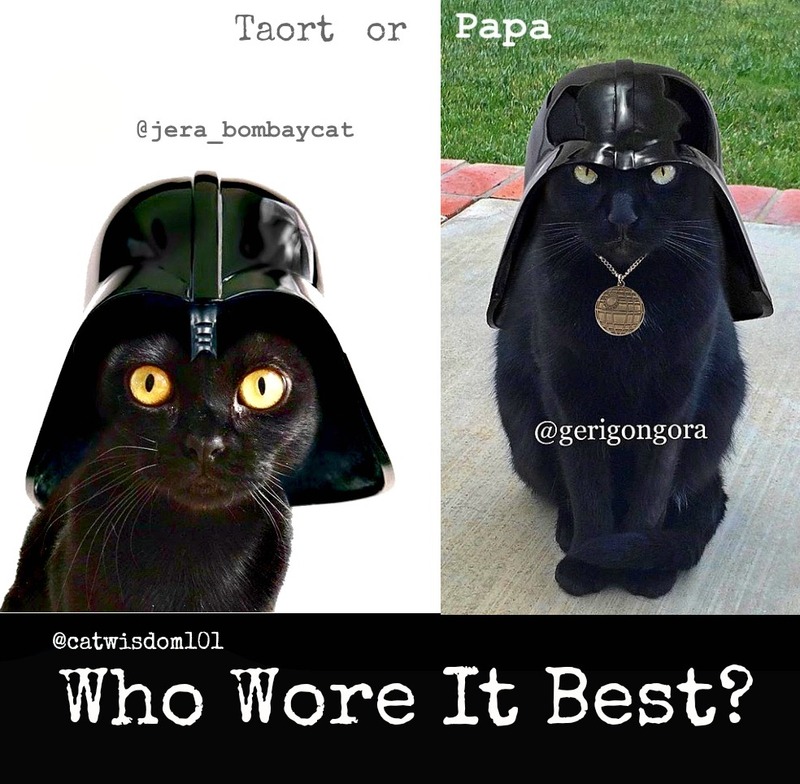 One Taort purrhaps as the younger Vader while PAPA pulls off the DARKSIDE older Vader to a TEE!!!!! We loves all of the dressups but you won’t put any finery on us without drawing back a bloody hand or two! I love that purple boa! This day was pretty much made for me, although I’m not actually dressing up today. I did enough of that at the cat show this weekend. If I had known that it was Dress Up Your Pets Day, I would have worked on snapping photos all weekend! Darn it! Going to add it to my calendar, so I remember for next year. 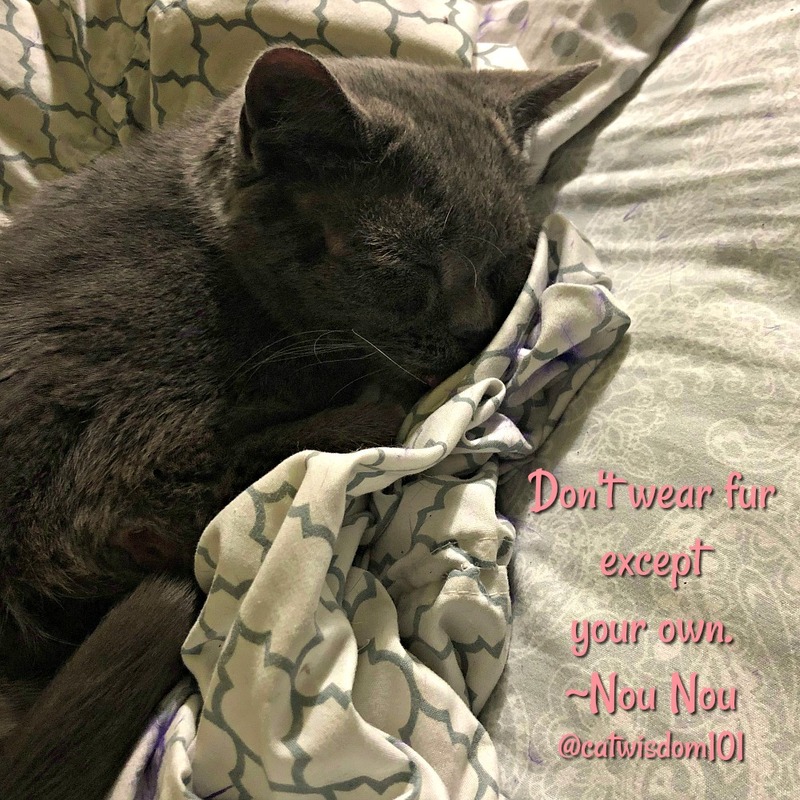 And “Don’t Wear Fur Except Your Own” is purrfect!